"Preventing Oakland Hills Fire Risks – one French broom pull at a time"
OAKLAND — It’s not hard to mistake French broom for an ornamental plant at first blush, with its yellow flowers, evergreen leaflets and slender branches. But some Oakland hills residents know there’s more than meets the eye. They see the shrub as an invasive pest that can endanger their neighborhoods by becoming fast fuel for wildfires. “It grows like crazy,” Wendy Tokuda, of Montclair, said of the French broom, which has gained a foothold on steep hillside slopes in her neighborhood. Tokuda, the retired Bay Area TV anchor, was among the nearly 30 Oakland hills residents who pulled patches of French broom on March 17 along sections of the 1.5-mile Montclair Railroad Trail. The monthly cleanup, organized by the Friends of the Montclair Railroad Trail, Friends of Sausal Creek, and Oakland Firesafe Council, is part of a longtime, grassroots effort to gain an upper hand on the perennial plant. “We periodically do these (French) broom pulls because it’s labor intensive — you have to do it by hand — and it’s the perfect time to do it, particularly with the rains, since the soil is soft and it’s easy to pull them out,” Oakland Firesafe Council President Sue Piper said at the March 17 cleanup. Similar French broom curtailing efforts also are being spearheaded by a number of organizations in Redwood Regional Park, Sibley Volcanic Regional Preserve and Huckleberry Botanic Regional Preserve and other East Bay open space areas, Tokuda said. French broom commonly grows up to 10 feet tall and can produce more than 8,000 seeds each year, according to the Berkeley-based California Invasive Plant Council. The shrub, native to Mediterranean countries, the Azores, and the Canary Islands, “displaces native plant and forage species, and makes reforestation difficult,” according to the environmental advocacy nonprofit’s website. It is believed that French broom was introduced to the Bay Area in the mid-1800s for its ornamental qualities but has spread along coastal areas, from Monterey County to Mendocino County, as well as inland regions, including Lake, Solano and Contra Costa counties. Oakland’s Public Works Department, however, does not have as much money as it did in past years to manage vegetation removal efforts in fire-prone, hillside neighborhoods, Tokuda said. Part of the problem, she said, can be traced back to the 2017 dissolution of the city-backed Wildfire Prevention Assessment District, which funded initiatives to reduce fire risks in a 16.5-square-mile area between Berkeley and San Leandro. Oakland hillside property owners voted in January 2004 to create the assessment district for 10 years but rejected a 2013 effort to renew it. At the time, the parcel tax measure was approved by 66.3 percent of voters, just 66 votes short of the 66.6 percent needed to pass it. Assessment district initiatives continued until June 2017, when all money collected until 2014 was spent. At least $177,297 was set aside for the city’s vegetation management efforts during the assessment district’s final fiscal year, which ended on June 30, 2017. Those vegetation management initiatives, such as cutting French broom, are now funded by the city’s general fund. Volunteers are now stepping up more to address glaring funding gaps in the city’s vegetation abatement services. Tokuda, who has been pulling French broom for the past 12 years, said the shrub’s roots grow deeper and branch systems become more complex when the plants are cut and not uprooted, she said. “If the city of Oakland is out of money and we know we live in a fire zone, we need to clear out what is called fuel load, and that’s what this is,” Tokuda said. “This is the kind of stuff that makes the fires burn so intensely,” she said. Jeff Kahn, from the Friends of the Montclair Railroad Trail, said the hard work and elbow grease from volunteers has started to pay off over time. The March 17 cleanup alone generated about 35 cubic yards of French broom that needed to be destroyed, city gardener crew leader Keary Brink said. “We each have different resources that we can tap into, so sometimes it’s helpful to collaborate so we can get them all amassed at one time,” Kahn said. “The tide raises all ships, right,” he said. We planted over 100 plants in the newly landscaped slope behind the parking garage in Montclair Village. AND we also had time to add plants to the Cortereal Corner meadow as well. The plants were donated by the Joaquin Miller Park Native Nursery run by Friends of Sausal Creek volunteers. Many kudos to the hard-working and efficient volunteers who came out in the cold and damp to get the job done. We planted over 150 native plants and hope winter rains eventually arrive. We got it all done thanks to a coordinated team of hard-working and enthusiastic volunteers. The hole diggers worked in tandem ahead of the planters. This area had been sheet-mulched for two years to suppress weeds in preparation for planting. 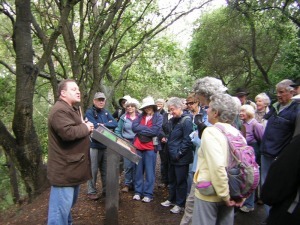 The plants were donated by the Joaquin Miller Park Native Nursery run by Friends of Sausal Creek volunteers. Volunteers have been on a watering schedule waiting until it starts raining. We were grateful to have water - supplied by a very generous neighbor! Come and enjoy Earth Day refreshments with us!! On January 16, Martin Luther King National Service Day, we joined Shepherd Canyon Homeowners Association and Service for Peace Volunteers to work on both the RR Trail as well as the Escher Meadow portion of Shepherd Canyon Park. We improved the drainage alongside the trail at "the cut" near the Corporation Yard trail connection and around the bend towards the Snake Road Bridge. The work done helped keep water sediment off the trail and it improved the accessibility of this important pedestrian connection. Are you wondering what all those colorful flags mean and why some bits of soggy newspaper are peaking out from under all those wood chips? They are evidence of a very successful Winter Solstice Planting day on December 18, 2010 organized by the Friends of Montclair Railroad Trail. This was our first plant restoration project with others to come in the future. The eventful day was all made possible by hard working community volunteers and the many native plants donated by the Friends of Sausal Creek from their Joaquin Miller Native Plant Nursery. Working weeks in advance, a small cadre of volunteers prepared the East Meadow site. They removed all the invasive thistle and non-native grass and laid down a protective layer of cardboard and pine chips. The Friends of Sausal Creek had cultivated the native plants to be installed in their nursery; many were from plant seeds collected locally in the Shepherd Canyon watershed. Selection for what to plant was based on: the level of sun exposure, the terrain and trees at the site, shape and color. The plants we used are listed below. On the day of planting, the weather was just perfect, cool & drizzly. The soil was easy to work after the rains. Fortunately rain held off until we finished for the day. Volunteers moved to the beat from a boom-box at the sign-in table and enjoyed hot chocolate and tea breaks along the way. Several of our 16 community volunteers were Piedmont High School students. A father-daughter and a father-son team from Shepherd Canyon Homeowners Assn. also joined us. We planted more than 70 native plants in the East Meadow and along the edge of the trail leading to it. Then we mulched them all with more layers of cardboard, newspaper and pine chips. Mulching proved to be the most physically demanding part of our day! It was truly an enjoyable morning with a palpable sense of community among us! It will take the remaining winter rains to help the plants become established and for wildflower seeds (California poppy and lupine) planted in January to sprout and thrive. By the end of this spring we hope to see new growth emerge in the East Meadow! 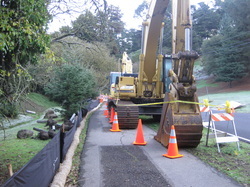 The city has began work on repairs to the storm drain system under Shepherd Canyon Road. This work will interrupt access on a portion of the RR Trail near Tiffany Lane. City’s investigation has shown that portions of the storm drain need to be excavated and repaired. This includes a section of the storm drain line running under the RR Trail at Tiffany Lane, where trail access will be interrupted during excavation. The city’s work schedule is somewhat constrained by weather conditions. So, it is not possible to define the exact dates of repair completion. The city had hoped to start before the rains, but encountered problems with the locations of other underground utilities not located where they were shown on their drawings, and thus, had to delay the work for a minor redesign. Ultimately, this work will improve the storm drain system and repair the sink holes on the Railroad Trail caused by the storm drain leakage. Also, It will help remedy other sinkholes that have occurred on Shepherd Canyon Road near Shelterwood. FOMRRT will share information and post updates on this page as they become available. Mike Petouhoff shares trail history. "Many thanks for the hike -- I thought it was great. I wonder if you'd mind passing along Mike's email. I had a nice conversation with him, and would love to follow up." "I loved the hike today. Mike was so interesting and I appreciate the time you spent to set it all up." "Thanks so much for an absolutely wonderful day! I always knew about the Key System, but never about the California Northern. To think a train ran all the way to Chico on electricity! Thanks also for educating me on its demise. What a shame! "